The Pythian Games at Delphi included musical performances, and may be one of the earliest festivals known. During the Middle Ages, festivals were often held as competitions. 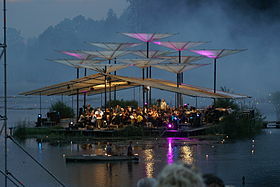 Another type of music festival is the music education type, often organized annually in local communities, regionally, or nationally, for the benefit of amateur musicians of all ages and grades of achievement. Entrants perform prepared pieces or songs in front of an audience which includes competitors, family and friends, and members of the community, along with one or more adjudicators or judges. These adjudicators, who may be music teachers, professors, or professional performers, provide verbal and written feedback to each performer or group. The adjudicator may be someone whom they might never meet in any other way, as is the case when an adjudicator from another city is brought in to judge. They also usually receive a certificate, classified according to merit or ranking, and some may win trophies or even scholarships. The competitive element is often played down, however, as the important aspect is that participants can learn from one another. Such festivals aim to provide a friendly and supportive platform for musicians to share in the excitement of making music. For many, they provide a bridge from lessons and examinations to performing confidently in public; for a few of the top performers, they provide a pathway to further professional study of music in a college, university or conservatory. Milwaukee, Wisconsin's 11-day event, Summerfest, promotes itself as "The World's Largest Music Festival", a title certified by the Guinness World Records and has been held since 1999. Operating annually since 1968, the festival attracts between 800,000 and 1,000,000 people each year, and hosts over 800 musical acts. The Woodstock Festival in 1969 drew nearly 500,000 attendees, and the Polish spin-off Przystanek Woodstock in 2014 drew 750,000 thus becoming the largest open air annual festival in Europe and the second largest in the world. In comparison, the Roskilde Festival in Denmark, attracts about 135,000 spectators each year. 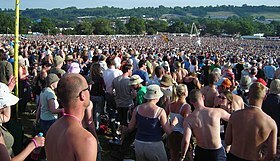 Glastonbury Festival has a capacity of about 275,000 spectators, but has "fallow years" roughly every five years, so it is the biggest non-annual greenfield festival in the world. The oldest annual dedicated pop music festival in the world is Pinkpop Festival in the Netherlands, though in other genres, there are much older ones: the Three Choirs Festival in the UK has run annually since 1719. The Queensland Music Festival, established in 1999 and headquartered in Brisbane Australia, is the largest music festival by land mass, as a state-wide music biennial music festival, over a three week period during July. ^ Rytlewski, Evan (11 July 2013). "Summerfest Attendance Was Up This Year, Which You Probably Guessed". Express Milwaukee. ^ "Fun in the Sun". My Midwest Magazine. 1 May 2007. ^ (pik). "Woodstock 2014: Manu Chao rozbujał, a Bukartyk pożegnał". Retrieved 13 December 2017. ^ Gammon, John (17 June 2011). "Six In A Row For Pinkpop". London, U.K.: Pollstar. Archived from the original on 13 August 2014. Retrieved 13 August 2014.